Imagine this: It’s your best friend’s wedding, and you have selected two outfits to don on the occasion – one during the Jaimala and the other during the pheras. So, you reach the venue wearing the first dress and carrying the other in a plastic bag. Sounds good? We bet it doesn’t! The situation could’ve been a lot better had you given the good old polythene bag a miss, and made a smarter choice by opting for a Shimmer non-woven bag. Not only would it complement your fancy outfit, the bag would also give you ample space to fit your dress, your wallet, you phone and anything else at one place. Shimmer non-woven bags by Zedpack are the go-to product if you want to give your fashion game a dazzling makeover. These bags are handy and give you ample space to accommodate your stuff. What’s more? 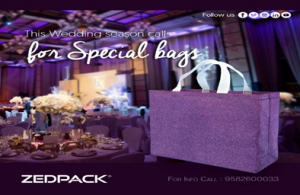 Non-woven bags by Zedpack are available in various colors, shapes and sizes, ready to cater to all you needs. However, the two qualities that make Shimmer non-woven bags by Zedpack extra special are: 1) they are eco-friendly, i.e. they burn without leaving any harmful residue, and 2) they are fully customizable! Yes, you read that right. Zedpack allows its customers to customize their bags the way they want – be it shape, size or color. To give your shimmer bag a more personal touch, you can even get your name printed on the bag. No more worrying about finding a bag that matches the color of your dress! Previous Love Dresses? Wear These Long-Sleeve Dresses Even In Fall!